AfH is pleased to announce the Shortlist of this years Design Awards. The winners will be announced on 22 June at the Reception at the European Healthcare Design Congress at the RCP. An intriguing idea for a project not yet delivered that explores eg a theoretical idea or concept for future care. A project selected from the shortlisted projects in the above categories that is outstanding. Hopewood Park is a 122-bed inpatient and outpatient facility for adults and older people. 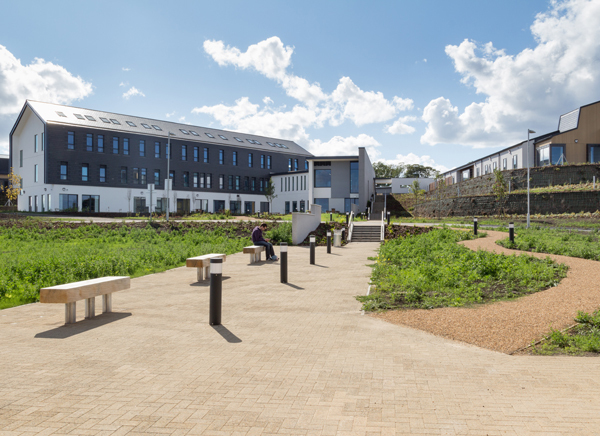 The new mental health campus provides a safe recovery-centred environment with generous and relaxing places to appreciate views to the coast and surrounding landscape. The brief was informed by consultation with local people, service users, carers and staff on providing improved Mental Health services in the Sunderland area, culminating in a new integrated campus. Consolidating services south of the Tyne in this meticulously planned setting supports efficient and effective management whilst dramatically improving the quality of psychiatric care. The extraordinary site overlooks the North Sea and inspired the name of the area, Ryhope, which describes a valley cutting sharply through the landscape. These natural features underpin the creative evolution of the architecture, landscape, art and way-finding strategy, reflecting the movement of patients, visitors and staff through the site. A ‘watercourse’ ‘flows’ down the site from the entrance in the north eastern corner to the bottom of the site in the south west. The elevated position, panoramic aspect and shelter contribute to the stepped form of a hillside community. A sense of neighbourliness is engendered through building form, layout and the clustering of residential units around a landmark shared therapy and activity centre at the heart of the complex. Internal ward is designed to provide the best care possible. A particular feature of the inpatient units is the use of the building itself to create secure external gardens and courtyards without the need for high fences.Single-loaded corridors enhance an open and airy feel; provide generous views and access to gardens and aid supervision and passive observation. 2 of 2 to offer an abundance of natural daylight. They are paired to allow safe and efficient staffing whilst designed to foster recovery through the placement of generous relaxing places for patients and staff to appreciate long views to the coast and the rugged surrounding landscape. The materials are natural and calming, a gentle nod to the surrounding mature landscape. The way-finding strategy is paramount; the materiality and approach to colour seeks to facilitate inclusion of the multiple users with the presence of symbols and references found in the wards. “I’ve been extremely impressed with the work by Northumberland, Tyne and Wear NHS Foundation Trust and especially the fantastic therapeutic environment at Hopewood Park.”Norman Lamb MP, Minister for Care Services.. Targeted with BREEAM ‘very good’, key elements include: enhanced U-values, natural day lighting, use of exposed thermal mass for temperature stabilisation and natural ventilation. Off-site construction was utilised for the timber frame; pre-cast concrete superstructures; pre-installed windows; en-suite bathroom pods and pre-fabricated building services. This proved to be a great success with programme; construction waste savings; enhanced quality, and improved health and safety. The project utilises photovoltaic cells, air source heat pumps and mechanical heat recovery systems as renewable energy. Control measures include: occupancy detection control linked to mechanical ventilation, heating and lighting systems and intelligent ‘self learning’ controls. The landscape comprises native species planting and enrichment of the varied ecological habitats culminating in a wetland area, providing a water attenuation space and further therapeutic amenity. South Glasgow University Hospital and Royal Hospital for Sick Children replaces four ageing hospitals across Glasgow, some of which date back to Victorian times. 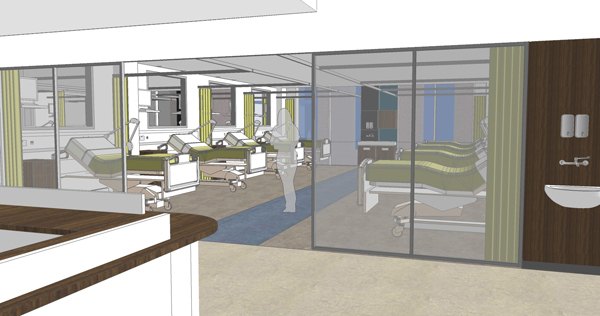 This technologically advanced scheme is one of the largest critical care complexes in Europe, the design of which supports a move away from the traditional ward based model of care. The overall campus design transforms healthcare for patients and staff by changing the way healthcare is delivered across the West of Scotland. 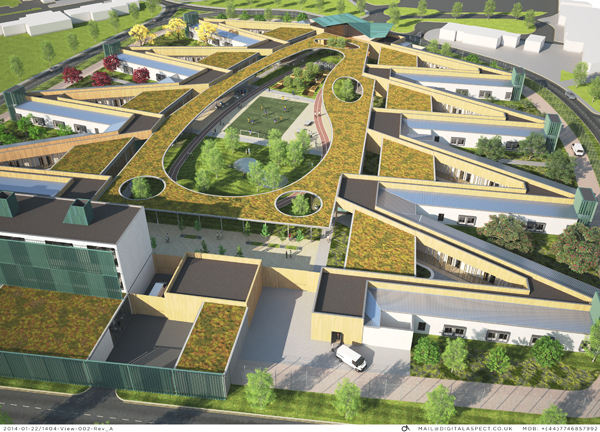 Linking into the existing functional hospital campus, the co-location of maternity, children’s / adult’s hospitals and learning facilities, delivers the new model of care envisioned by NHS Scotland. Responding to its urban context, the 14-storey hospital transforms the Glasgow/Govan skyline. The architectural form and massing clearly defines the hospital as three elements, which draws on Glasgow’s rich maritime heritage; ‘The Vessel’ (children’s hospital), ‘The Dock’ (adult podium) and ‘The Beacon’ (adult ward tower). 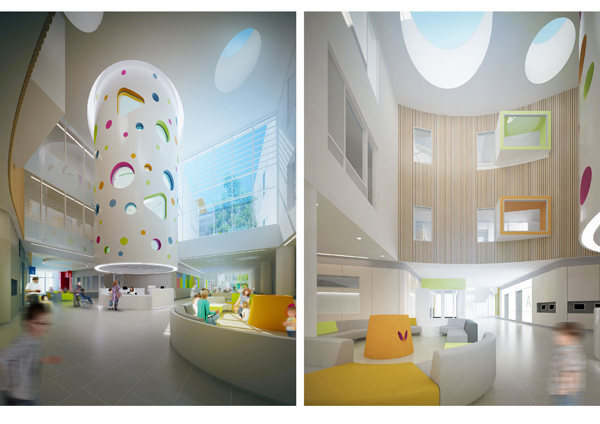 Careful arrangement of the two buildings ensures that there is mutual compatibility, whilst creating an identifiably distinct character for the adult and children’s hospitals. This is expressed externally and internally, to reflect the nature of the patient groups . Seen as a catalyst for local regeneration, the scheme also sets a new benchmark in healthcare delivery. Designed to deliver a non institutional environment, the strategic use of form delivers a flexible template, where bed units can expand or contract around the form to suit changing clinical needs. The Children’s Hospital utilises innovative ‘cruciform’ wards, which promote patient interaction, maximise observation by staff, while minimising MRSA infection rates. To support an effective working environment, Automated Goods Vehicles (robots) deliver the FM support functions 24 hours a day. Bedroom/en-suite configurations are standardised / flexible and designed to maximise usable floor area/daylight and views, enhancing the patients/staffs experience with regards to effective working, healing, safety and privacy. The design delivers a high quality healing environment, which provides a reassuring, enjoyable legible and safe environment for all patients, visitors and staff. Set within therapeutic parklands giving abundant, green spaces for all users as well as the community, the design utilises excellent standards of space, height, materials and technology, in an effort to create a “hotel like” environment. Vibrant atriums (adult/children) further enhance the non institutional design vision and provide spaces for social interaction, cafes, retail and a cinema, as well as housing state of the art innovative ‘distraction technology’ through collaboration with Glasgow Science Museum. 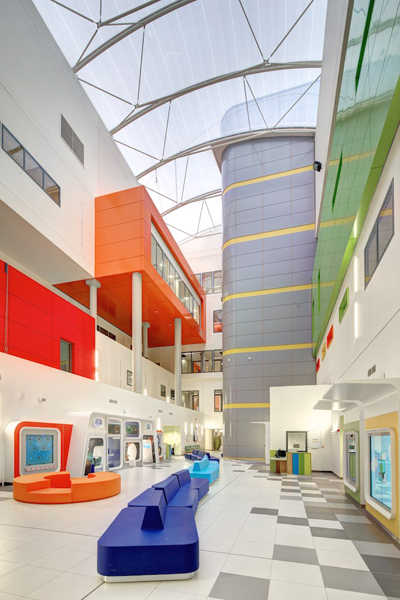 The Hospital is the first major acute hospital of its size to be designed to achieve a BREEAM ‘Excellent’ standard. This low carbon design 80kg/m2 year carbon emissions, also has an enhanced “U” value and low air permeability of 5m3/HR/m2@50PA. Several environmental carbon saving features were included in the design, including a standalone energy centre utilising CHP units, specification of low carbon embodied products coupled with a Waste Resource Action Plan (WRAP) minimising waste to landfill. A sustainable urban drainage system within the parkland setting coupled with green roofs and a detailed sustainable transport strategy further enhanced the sustainable features. REMEO® Respiratory Centre is a high-tech 20-bed satellite centre to the renowned chronic respiratory failure Lane Fox Unit at St Thomas’ Hospital, London. It is the UK’s first purpose-built centre to ‘wean’ respiratory patients from invasive mechanical ventilation, improving recovery rates and enabling patients to eventually return home. In line with NHS England’s plans, the centre helps match the gap in the provision of this specialist service, frees up critical care beds, improves the delivery of clinical services closer to patients’ homes and provides specialist training for local healthcare staff and carers. Commended by the planning authority as ‘a worthwhile contribution to its setting’, the building has been sensitively located adjacent to protected ancient woodland in the grounds of East Surrey Hospital. Mono-pitched roofs, with large areas of glazing, including those at high-level, flood the building with natural light and provide views and access to the natural landscape throughout. Outdoor terraces blur the boundary between indoor and outdoor space, promoting an atmosphere of relaxation, supporting the rehabilitation process. A revolutionary model of care for complex respiratory patients. amend drug prescriptions and speak directly with patients and staff. “A major step forward in the integration of technology and healthcare to improve patients’ experience and outcomes” Baroness Lane Fox, digital pioneer. An innovative four-bed bay layout ensures all patients have a window, with the ability for future adaptation to two single en-suite rooms. The central social space sliding partition allows instant change. Medical facilities installed behind artwork in social space mean the area can be temporarily used as patient space. Room sizes and proportions can adapt to a wide range of activities. A less institutionalised facility, with focus around social spaces. One that is ‘homely’ whilst meeting Care Quality Commissioning requirements. A layout providing privacy and dignity without compromising the need for close staff observation. Level access and medical gas points throughout for complete patient freedom of movement. A courtyard offering a controlled external environment for vulnerable patients. Observation windows sized and located to maximise visibility around the unit and to provide the benefit of borrowed daylight. Services and technology discreetly placed, at times hidden, reducing the clinical nature and enhancing the therapeutic feel. Commissioned murals further enrich the building design. 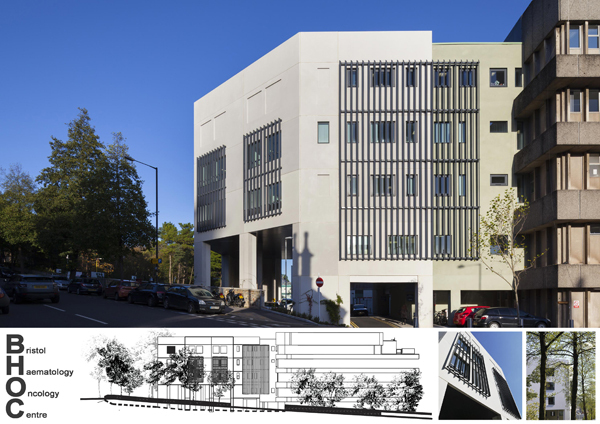 The original building for Bristol Haematology and Oncology Centre (BHOC), was built in the 1970 and was in need of updating and extending to bring it in line with current standards and models of care. 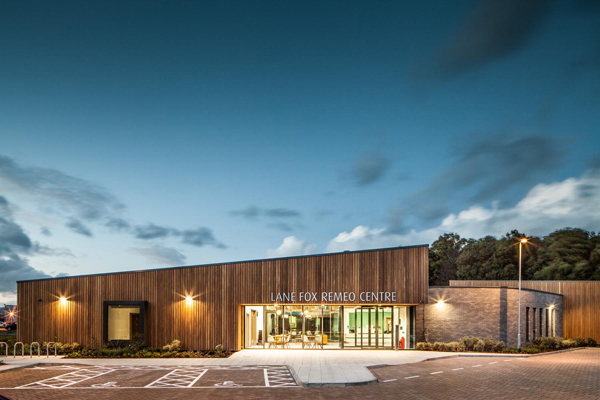 The project included the extension and refurbishment of the existing building including a new LINAC facility, teenage / young adult accommodation and Teenage Cancer Trust (TCT) Facilities. The scheme has allowed more patients to be treated, in more appropriate facilities, using modern procedures. Two new LINAC bunkers have been created below ground to expand existing services and accommodate newer, more powerful and more accurate machines. TCT research has clearly indicated that age appropriate facilities have a positive impact on cancer treatment delivery for this vulnerable age group and allow a normalisation of life despite cancer. The project includes a Teenage and Adolescent centre part funded by TCT with a fit-out designed in collaboration with AHMM. The extension to BHOC is in a very prominent and sensitive location. It is opposite a grade 2 listed building, forms a new frontage to the road, is on the border between a number of conservation areas and is overlooked by numerous buildings. The trust therefore instigated meetings with the local residents committee to discuss thoughts and concerns over the design. The design developed from a very conceptual stage with the input and feedback from local residents and although, not all the feedback was positive, the majority have welcomed the scheme and “like the way it covers up the gloomy façade of the existing Oncology building”. The final form of the building reflects a positive response to comments on issues such as context, scale, massing, sustainability and buildability. The BHOC treats people on a daily basis with terminal or life threatening illnesses. Creating the right environment for that treatment to take place has been proven to improve the emotional perception of the experience. The appropriateness of materials, colour schemes, interior decoration and artwork, all contribute to a sense of calm. Due to ongoing extensive research the treatment of cancer is constantly evolving. It is therefore essential that a building of this type is able to evolve accordingly. Modular room sizes and a centralised circulation core, combined with the use of lightweight partitions allow for maximum future flexibility, with minimum disruption to services. Functional content and clinical adjacencies have driven the space and area of the building forming a series of floor plates of differing sizes, with largest at the top and smallest at the bottom. The physical constraints of the existing building, entrance and external circulation (people and vehicles) and the topography of the site have all contributed to the final form and massing of the new building. Citylabs’ aim is to create a commercially viable 10,000 sq m centre for health and related bio-medical facilities in line with the requirements highlighted in the Zernike report 2008. 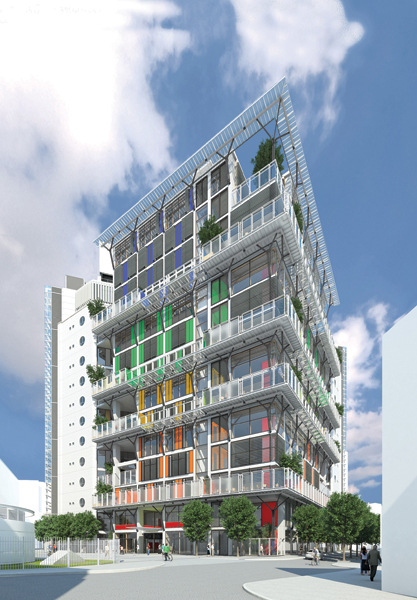 It is a new concept in high-specification, flexible healthcare, laboratory and office space. The project, located on the Central Manchester Universities Hospital NHS Foundation Trust site, promotes collaboration between healthcare clinical research and treatment, allowing the medical community to benefit a “from bench to bedside” approach. The facility is designed to enable its tenants to locate in the heart of Europe’s largest clinical campus, providing access to skilled clinicians and researchers, local access to safety and ethics group support, access to local patients and volunteers for clinical trials. The new clinical research facility comprises the retention and renovation of the Grade II listed former Royal Eye Hospital and a new innovative building to the rear. The latter is characterised by facades created from red perforated screens that reflect the pattern of the brickwork of the existing building. A key aspiration for the development was that the uses of the building be arranged to provide active frontages giving a positive connection between the occupiers and the wider community. It is intended that shared facilities such as meeting spaces will be used by all on the hospital campus. The principal tenant for the development was a major clinical trials company, ICON Development Solutions Ltd, a global provider of outsourced development services to the pharmaceutical, biotechnology and medical device industries. As ICON were also Sheppard Robson’s client, we were able to work with both the developer, Developer and Hospital Trust to develop a building that could accommodate their needs with grid and servicing models that could then be adapted to research requirements. As well as meeting a specific technical brief, Citylabs also includes laboratories that could accommodate biology and possibly chemistry related activity, in flexible suites of over 500 sq m. In the absence of any defined end users, the design was developed as a speculative space, which anticipated the future requirement of the first and future generations of occupiers and changes to technologies that have yet to be identified. In close consultation with English Heritage we demonstrated that the best way ensure the long term viability of the existing listed building was to demolish those parts that were fit for no future purpose (around 50% of the existing structure) allowing new build fit-for purpose accommodation to be created. The crisp recliner plan of the new build which can accommodate a broad range of uses (current uses include multi-bed wards and Hitachi’s medical devices), married with retained space for administrative functions (current tenants include Manchester College and Nuffield Health). Citylabs was designed and created with sustainability in mind from the outset and this focus has been rewarded through its Excellent BREEAM rating. The structure’s sophisticated use of glass facades, in conjunction with its range of other energy-efficient materials and design fixtures (like spandrel panels and solar control glazing), have contributed to its ultra-low U-value. This measure of thermal performance is around 50% lower than the façade of an average building. The need to partially refurbish the existing main entrance building is taken advantage of to create an entirely new public face for the hospital. A clock tower is located at the intersection of two long views, anchoring the hospital in the city. The plan form was carefully developed to maximise the retention of existing buildings in the conservation area. Materials and façade composition complement the adjacent historic buildings. On wards, decentralised touch-down bases ensure that staff can position themselves at point of need. A bedroom window design has been developed with enclosed adjustable blinds within secondary glazing, addressing infection control issues while facilitating ease of maintenance. An innovative ‘t’ shape plan for multi-bed bays ensures that all beds in a 4 bed bay are adjacent to a window/light/views and fresh air. The building makes use of Sheffield’s District heating system for both heating and cooling, creating one of the lowest carbon emitting health buildings in the country and achieving BREEAM Excellent. This flexible, adaptable, shallow plan building is needed by the local community, improves the environment and is built by local constructors – a truly sustainable development. TP Bennett are working with UK and Ghana based client NMS Infrastructure to deliver 6 new district hospitals across Ghana. Working for the Ghana Ministry of Health (GMoH), the team have developed a design model which moves forward from the generic, high energy consuming, ‘white box’ hospitals which have been built in developing countries in recent years. The hospitals are designed in response to the health needs of the Ghanaian population and to improve the experience of the patients and visitors accessing healthcare. External shaded verandas, built around landscaped spaces are used for circulation, waiting, therapy and community education. Wards are open-plan, with high ceilings and louvered French windows which open onto garden courtyards. The buildings support complex clinical functions and attention to infection control, but this is only part of a wider therapeutic and supportive environment, with each patient having views and access onto therapeutic and relaxing external spaces as part of their treatment and recovery. the often frequent power-cuts and are more affordable to run. understand the spaces that they need to host and treat their patients. possible environment for modern research and teaching. A parallel objective has been to create a building which will stand out as an identity-creating, sculptural linchpin for the entire Panum complex and the university’s Nørre Campus (i.e. the North Campus) as a whole. The new complex is also intended to act as the generator of a positive urban development in its immediate neighbourhood and in relation to the entire city. auditoriums, classrooms, canteen, show lab, conference rooms and book café. new social hub of the complex. The plaza accommodates the main entrance and will serve as the main social meeting-place, linking all functions between the new and the existing Panum complex. The new Panum complex will have an open and outward-looking appearance, with a transparent ground floor that will help to blur the boundaries between the building and the city. The public will also be invited to visit the top of the tower, where there will be a café, lounge and viewing points. links to the surrounding city. With its organic forms, the building expresses signal power and innovation, but is also adapted to the existing Panum complex through its colour scheme, rhythm and gravity. up the building’s large scale. 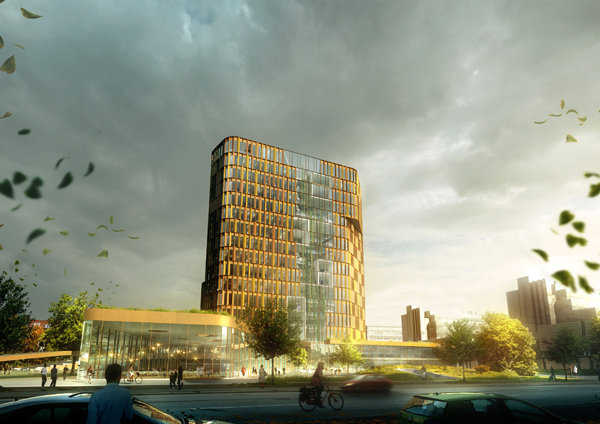 The project will be pioneering in energy usage, with Denmark’s most energy-efficient laboratories, in which waste energy from the ventilation system will be recycled in the overall energy balance of the building to a hitherto unprecedented degree. 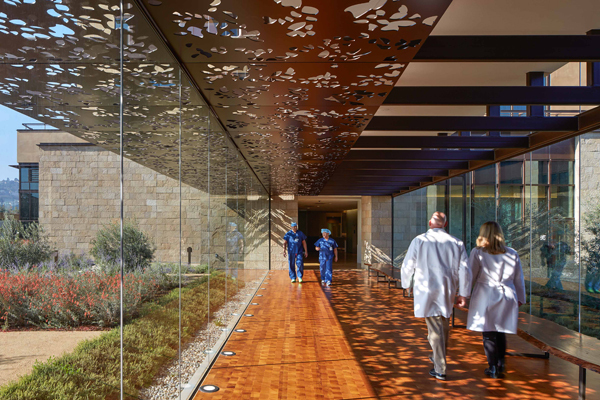 NBBJ designed the San Carlos Center, an integrated healthcare campus for Sutter Health’s Palo Alto Medical Foundation (PAMF), to be an uplifting and enriching environment for people to heal, work, and connect with one another other. By combining the romanticism of the historic mission with the brightness and cleanliness of modern expression, the Center provides an ideal space for high-quality healthcare while also paying homage to the surrounding community. Using sustainable design approaches, the San Carlos Center engages with its magnificent natural setting while operating with minimal ecological impact. Each space in the San Carlos Center is crafted with the theme of rejuvenation in mind. The main lobby’s entrance is composed of full height walls of Colorado sandstone; the exterior entry canopy extends into the entry lobby, providing a continuous soffit composed of reclaimed Redwood. A striking full height wooden block wall made from repurposed Douglas fir beams frames the reception area. The locally sourced reclaimed wood features provide a warm welcome for patients and visitors. Seating areas, filled with artwork and views of the natural landscape, are meant to bring patients a sense of comfort and intimacy. The San Carlos Center’s artwork celebrates its community while promoting healing and vitality. Decorating the building are a variety of indigenous materials and commissioned local artwork, which encourage a connection to the region’s geography and people. A horizontal photography niche, comprised of more than 50 breathtaking photographs of the immediate landscape, specifically taken for this project, runs the length of the clinic lobbies on all four floors. Graphic illustrations and photographs commemorate the region’s indigenous plants, such as rosemary, lavender and aloe, symbolizing the center’s dedication to health and wellbeing in the San Carlos community. Designing the Center, we focused on building something that would inspire its personnel to deliver the best care possible. Open office work spaces in each clinic afford an abundance of natural light as well as frequent communication and collaboration amongst teams. Special enclave spaces and meeting rooms allow for focused work and private conversation as needed. We also ensured that PAMF’s San Carlos Center fosters a strong relationship with the physical environment outside. This connection is particularly evident through the building’s strategic use of daylight and its extraordinary courtyard and gardens. The building’s true southern orientation allows its interior courtyards to draw and harvest natural daylight, while a large exterior awning was designed to soften intense light. Three custom keyhole stone arches, a major art element commissioned by the client, establish a threshold into the campus. These arches also serve as entrances to a series of south-facing gardens, which feature plants from various regions around the world that are at the same latitude as the San Carlos Center. A vibrant botanical courtyard links the main lobby to the main clinic lobbies and is traversable through an enclosed walkway. Passing through the walkway and courtyard, a canopy with illustrative cutouts creates a foliage-like pattern of dappled light; their exquisite shadows adorn the walkway’s walls and floors throughout the day. Momentary respite is further encouraged by a 45-foot-long California walnut bench facing a wondrous, sprawling view of the region. This design concept was developed as part of a high level proposal to the client. 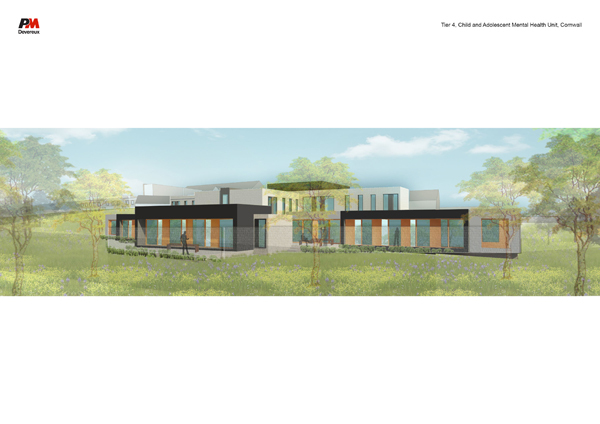 The brief is to provide a 90 bed inpatient facility with scope to enlarge to 120 beds developed to co-exist next to Ashworth Hospital, one of the UK’s three National High Secure Mental Health Units. Medium Secure facilities have become increasingly ‘secure’. This proposal complies with current compliance standards while minimizing the stigmatizing impact of these secure requirements both externally and within the facility. A major challenge is to maximise the usable space on site whilst providing a secure perimeter with sterile zones and observation lines. The design maximises the use of the secure site to cater for the widest range of recovery-focused activities. By pushing the secure perimeter to the outer ring of the site and using the “sterile” zone as a staff only logistical “ring main” saving 15% of site area. All the staff only and maintenance functions are separated from the patient areas. This means that bedrooms and day accommodation can be ordered around the mid ring with a sheltered inner ring or “mall” of educational, amenity and therapy spaces. The central lozenge shaped parkland introduces softer forms with 400m running track is modeled to vary the experience and provide for an enhanced range of activities in what can be a very limiting and dull setting. The campus offers a direct pathway from a high secure to a local medium secure setting. This provides a continuum of care expanding the range of activities that can normally be accommodated whilst enabling consistency of care under the same clinical teams. Recovery is incentivised by allowing for a very wide range of self-directed activities and amenities to take place in an easily controlled and supervised setting. The large entrance block would house both administrative facilities and a penthouse of step down apartments. The proposal envisaged a café, training garage and shop forming part of the “go to work” programme in preparation for discharge to a community based setting. Standardising ward and room layouts allow staff to work safely in familiar settings with consistent operating procedures. Separation of maintenance and facilities management access minimise disruption of services and reduce risk. In response to the anticipated need for growth and change, the site plan creates a framework for expansion of 90-120 additional beds or an additional 33%. This provides the site working area during construction and is designed to minimise on-costs but also gives a platform for future enlargement without compromising security. The secure campus employs hundreds of staff. Ashworth and HMP Kennett are currently a dominant physical presence. 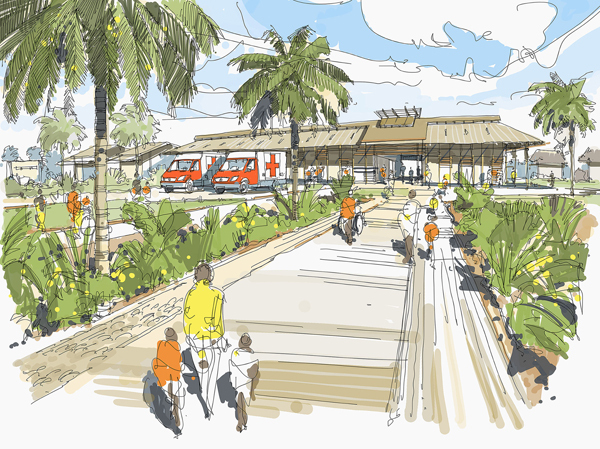 This proposal creates a landmark entrance feature for the whole of the campus and places a positive animated and stigma-free complex at the centre of the site communicating a professional caring ethos and enhancing the NHS Trust brand. The aim for the new Cancer Centre at Guy’s Hospital is to create uplifting, non-institutional architecture that supports the activities within by consolidating cancer treatment in one building and making the experience easier and less stressful for patients. The Centre is made up of a number of stacked ‘Villages’, each with its own distinct identity relating to a particular patient need. By breaking up the functions of the building into multi-storey chunks, a human scale is created to help orientation and make the Centre more user-friendly. Visitors exit the lift at their desired section and enter into the ‘Village Square’ – a non-clinical space that includes a planted external balcony as well as informal seating and relaxation areas from where patients can navigate to specific rooms via lifts and stairs. There are three Villages for treatment: Radiotherapy, Chemotherapy and Outpatients. Each Village contains most of the facilities that a patient requires for a particular treatment, reducing their travel time around the hospital site. Two other areas complete the building: a Welcome Village at ground level containing communal facilities; and a Private Patients Unit on the upper four floors. Welcome Village: The main entrance of the Centre is a double-height indoor-outdoor space that creates a welcoming environment and establishes the layout and feel of the rest of the building. There are a number of active uses at street level including retail, café, main reception, The Dimbleby Cancer Centre, rehabilitation gym and other drop-in facilities. Radiotherapy Village: Notably, the new Cancer Centre will be the first in the UK to wholly locate its radiotherapy treatment facilities above ground floor level – a key design decision following patient feedback. This will integrate radiotherapy as part of the normal life of the building and allows both patients and staff to benefit from views and natural light. The Village is vertically stacked over three consecutive levels, each level corresponding to a particular stage of a patient’s treatment. The floors are organised into high technology zones towards the rear of the building footprint, and low technology zones towards the front. Chemotherapy Village: The Chemotherapy Village brings together into one unit a range of services that are currently delivered separately, offering maximum flexibility whilst retaining a patient-friendly environment. This is achieved by zoning into different treatment areas, giving patients the choice between a communal area and a more intimate space. This layout means different types of patient groups and treatment sessions can be run concurrently, increasing both the flexibility and capacity of the unit. The Village also includes a research floor for King’s College London, resulting in a more complete integration of research and treatment activities through the potential to involve a much larger proportion of patients in clinical trials. Outpatients Village: This Village brings together elements that outpatients are most likely to use such as imaging and minor procedures facilities, allowing them to remain in the same place for the duration of their visit. It is designed to service patients at various stages of their cancer pathway from diagnosis and treatment through to follow up checks and end of life care, allowing them to receive co-ordinated, multi-disciplinary care in a single visit. Cornwall Partnership NHS Foundation Trust is a provider of mental health facilities in Cornwall looking to procure a new Tier 4 CAMHS unit in the region; the proposal will be meeting a national requirement for improved and increased CAMHS services within the UK and will be unique in the country, providing inpatient accommodation for service users up to the age of 25 years old. Adolescents are legally required to move into adult accommodation at the age of 18. Many of these users are better suited to a CAMHS’ environment and care model than that of an adult acute unit. This provided a challenge as legally, the over 18’s would not be able to mingle with the children and adolescent service users. This led to a unique design utilising the idea of residential clusters for smaller groups but with the ability to access some shared areas. The design has two 6-bed clusters and one 3-bed cluster with swing zones between to enable 2 beds to each cluster to swing and optimise flexibility in the group number. Each cluster has an independent lounge, a quiet room and access to an outside space in the form of a courtyard garden. Without passing through other clusters, there is access to a shared dining facility, activity room and other shared facilities, which will have timed availability. The different age groups can be segregated whilst all being within a CAMHS environment under the care of a CAMHS staffing team and model of care. Staff facilities are centrally located to ensure access and observation is maintained. At the front of the unit, a cafe and gym are located to provide further shared space where service users can meet friends and family in an appropriate space which de-stigmatises their situation. The upper floor also has an education suite with classrooms, therapy rooms, music and ADL kitchen facilities. Design options have been developed as the final preferred site has not been chosen. Each is designed specifically for the relevant site but still observes the principles outlined above. Both options look to create a contemporary building that young people can identify with, whilst using vernacular materials that reference local context such as stone walling. This is used in conjunction with a contemporary palette of metal cladding to promote a contemporary style suitable for a child and adolescent environment. This is located on a fairly level open piece of land within one of the Trust’s hospital sites. This has given the opportunity to develop the internal courtyards within the plan layout. This option is on a sloping site within the same hospital allowing pavilions to be set into the gradient of the hill. The cafe and education facilities are set at the upper ground level and the residential clusters with private gardens are located on a lower ground level. The building utilises Passivhaus techniques which look at building orientation, fenestration, air tightness and good detailing to promote energy efficient design. During the next stages of detail design we will be looking at other measures that may be appropriate such as biomass boilers, combined heat and power and ground source heat pumps.